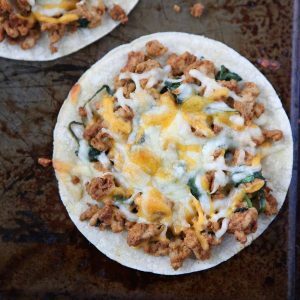 These simple Turkey and Spinach Baked Tostadas are a perfect family meal for busy weeknights. They come together quickly with just a few ingredients! Preheat oven to 375 degrees. Spread corn tortillas on baking sheets and set aside. In a large nonstick skillet, brown ground turkey. Add taco seasoning and stir while cooking. Once turkey is cooked through, add chopped spinach, combine until warmed through (or wilted if using fresh) and taste for seasoning (depending on your taco seasoning you may need to add salt once you’ve added the spinach). Set aside and let cool for a few minutes before topping the tortillas. Top each tortilla with approximately 2 tablespoons of turkey and spinach mixture. Top with desired amount of cheese. Bake in 375 degree oven for 12-14 minutes until tortillas are crisp and cheese is melted.